We service all makes of regulator in our fully equipped service room by technicians trained and certified by the manufacturers themselves. We guarantee that every regulator is fully serviced to manufacturer guidelines using genuine and original manufacturer parts. Every regulator is checked for faults and condition before stripping it down to its component parts which are cleaned in an ultrasonic cleaner and inspected for damage. 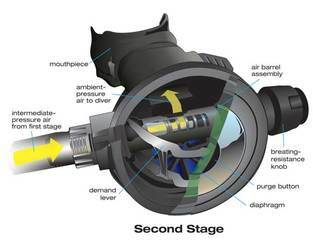 The regulator is then reassembled using the recommended service kit and lubricated with cristolube (﻿﻿nitrox ﻿﻿compatible to 40%). The assembled regulator is adjusted using a magnetic gauge to ensure the regulator breathes exactly the same as the first day you took it out of the box. The brands to the right are just some of the manufacturers we are qualified to service. We are also a recognised Mares Lab. In general, we operate a 7-10 day service from when we receive your regulator, although an express service is available at an extra cost. We hold a wide range of service kits but service time is always dependent on the availability of parts, and your technician will let you know at the time of booking. How often should I service my Regulator? Manufacturers recommend servicing of their equipment every 12 months or as soon as you sense any sort of problem, such as a change in ease of breathing. Regulators which are subject to heavy usage, such as in dive centres, should be serviced every six months.